SEE MORE. GET MORE. ENTERTAIN MORE. 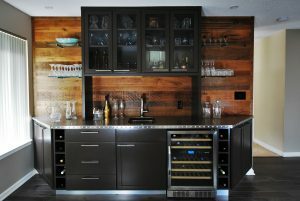 Holiday entertaining made merry with dramatic wet bar design. Authorized Siteline dealer, Lisa Tobias of Tobias Design, Hopewell, New Jersey created this mixed materials wet bar for a pair of empty nesters who are downsizing, but not downgrading their lifestyle. 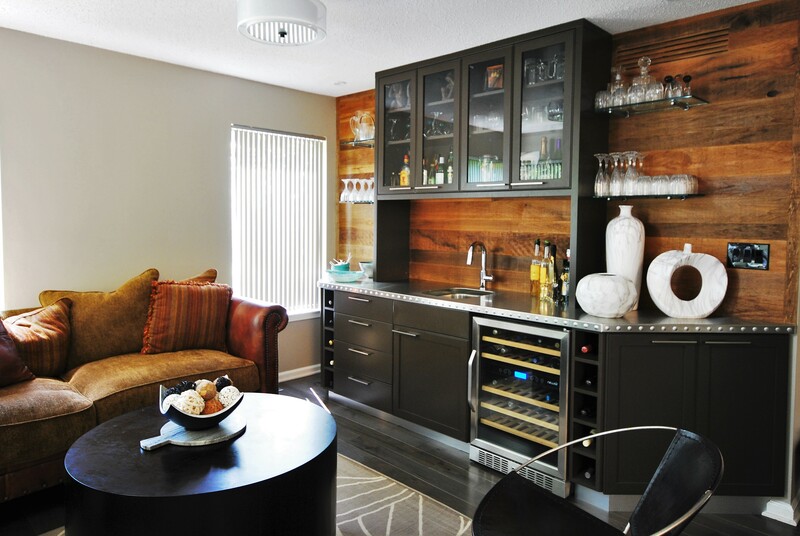 Lisa designed this striking wet bar in the gathering area of the couple’s remodeled townhome. The open concept entertaining space is complete with wine storage, wine refrigeration, display cabinets, glass open shelving and a custom (locally fabricated) stainless steel countertop. Lisa says that the homeowners wanted to mix rustic and industrial elements, to create a unique vibe. “Siteline cabinets provided me with a reasonable way to achieve a strong focal point for this room,” Lisa adds. Using the Siteline Fleming flat panel door style in the “Black Fox” paint color, Lisa created drama with the cabinets, installed against a reclaimed wood wall treatment. “Siteline is an affordable approach to a sustainable value for homeowners,” Lisa notes. Like this look? Click here for all Siteline paint color choices. Click here to learn more about Tobias Design and this project.